This was my first season with my own car. It was still very under developed as was the driver! The rear springs were 300lb/in and the front was tried with 350lb/in springs. 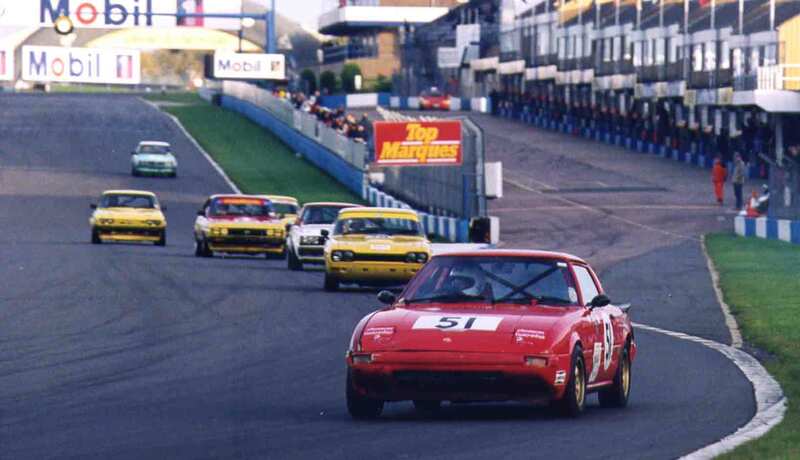 The Ford Type 9 (Capri) gearbox with Quaife internals was allowed by the CSCC as the ratios are identical to the Mazda Competition box and the standard unit would explode! The car is geared @9,000rpm for 185kph (115mph) in 4th, 212kph (132mph) in 5th. In the Paddock at Mallory Park and Actually on track if not strictly racing! Far right picture at Mallory Park's Devil's Elbow missing the apex by the width of a Camaro! The Rover #17 and the Chevrolet C31 based motor home were Jon Owen's. The speed of the car in a straight line made up for my inability through the corners!